Affordable, powerful motor, wide feed chute, dishwasher-proof parts, easy to assemble, leaves pulp completely dry. Everybody wants to stay fit and healthy but not many want to go through the pain of preparing healthy food. While a liquid diet sounds perfectly appealing, preparing fruit and vegetable juices can be really taxing if you do not have an efficient juicer. Hamilton brings you the Hamilton Beach 67608, which is efficient, easy to use and bearing a 1.1 HP powerful motor extracts essentially the entire juice from almost any substance, leaving only dry pulp as residue. The pulp bin being sufficiently large allows you to juice for longer duration endowing the juice rich in nutrients. In fact, as the name “Big Mouth” implies the feed chute is wide enough to accommodate whole fruits and vegetables saving you time on chopping, dicing or de-seeding. It also comes with removable dishwasher safe parts, making it is easy to assemble and clean after use. You can use it for several years without any hassles and enjoy the benefits of healthy juicing. Juicing isn’t always about producing the maximum yield or getting the healthiest possible extract. The Hamilton Beach 67608 isn’t a top-of-the-line juicer neither does it attempt to compete with high end models. It is a simple juicer designed to extract juice from anything thrown at it. We found it did well with watery substances, leafy veggies and hard fruits although it never excelled in any juicing any of them. Also, don’t run it continuously for too long as it is mostly plastic in construction so the motor tends to heat up every component when it runs for more than a few minutes. Using the Hamilton Beach 67608 is a cakewalk! You’ll be taken aback at the ease with which it works. Called “Big Mouth”, the feed channel is indeed wide and you can easily fit in whole fruits and vegetables, be it of any size such as carrots, apples, beet, pineapple (not exactly the entire fruit! ), cucumber, spinach, tomatoes, lemons and any other fruit or vegetable under the sun. Simply put the contents in and turn it on, eliminating time-consuming steps like chopping and deseeding. However, it is advisable not to manhandle the juicer by forcibly trying to push the whole fruit if it does not comfortably pass through. A few seconds extra on splitting it into half will not do any harm. 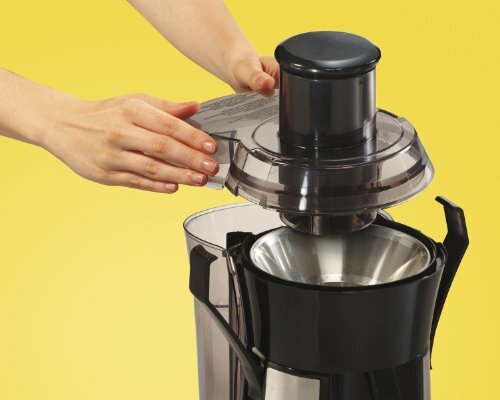 The best feature of this Hamilton Beach 67608 juicer is its easy cleaning. Since, the juicer is made of high grade removable, dishwasher safe plastic parts you can easily disassemble it after use and as per your convenience either clean under running water or simply put it inside the dishwasher. To be precise the four major parts that need to be cleaned are the blades, the cylinder, the feed chute and the juice glass. The extra-large pulp bin and separate juice and pulp outlets makes sure that there is no unnecessary mess. Although it does not come with any additional tools to aid in cleaning, at this price you can’t complain much. It is only natural to doubt the quality of juice extracted from a juicer at this price. However, put all your doubts to rest, sit back and enjoy absolutely smooth, nutrient rich and froth free juice. The quality of juice is good enough to be stored under refrigeration for at least 3 to 4 days. However, do not expect absolutely tasty and froth-free juice since this is a quick juicer that heats up the juice. The Hamilton Beach 67608 juices to perfection almost anything that you put into it. Be it leafy greens, hard substances like pineapples and carrots, soft tangerines and tomatoes or watery cucumbers, this juicer can extract the maximum juice out of all these and many more fruits and veggies. Moreover, the pulp extracted is also completely dry and need not be put through a second phase of juicing. For the sake of testing, we actually re-run the pulp in the juicer a second time and found it to release a few extra drops. 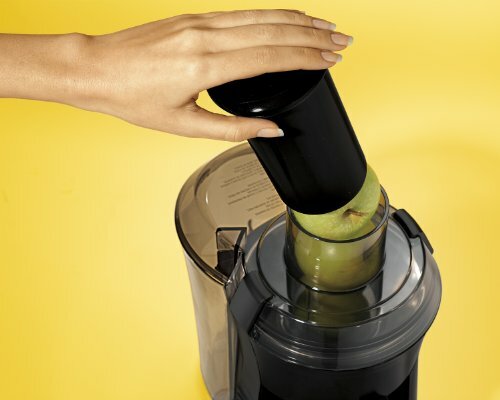 In other words, you won’t have to perform additional runs with this juicer. Carrying a 1.1 horsepower 800 watt motor, the Hamilton Beach 67608 juicer is powerful enough and long lasting. With such a robust motor any substance can be easily turned into delicious juice. However, one disadvantage of this juicer is that there are no speed settings or levels, meaning it can only be turned on or off with the level of speed always remaining constant. The noise level is like any other regular juicer and well within tolerable limits. Whether you are juicing hard nuts or fruits or leafy veggies it does not become unbearable or difficult to have a conversation. In short, it will definitely make its presence felt but not to an extent that you would need ear plugs. 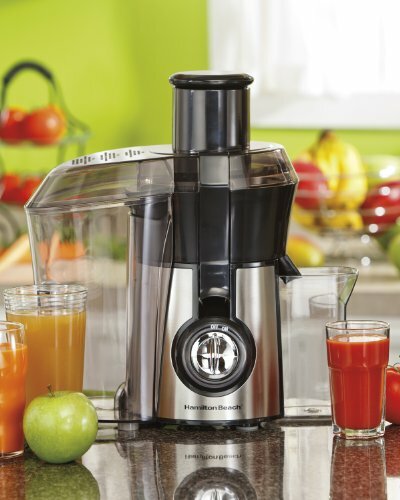 The Hamilton Beach 67608 is essentially a blend of great price and great features in one juicer. A combination of metallic body and plastic parts, it is easy to assemble and easy to use. The wide inlet allows big sized or whole fruits and vegetables to comfortable fit in and the 1.1HP powerful motor ensures that everything is juiced to precision with residual dry pulp. Furthermore, the parts are dishwasher safe ensuring painless cleaning and the large pulp bin gives more leeway to juice. The only demerit is that there is just one button for on and off with no speed options. 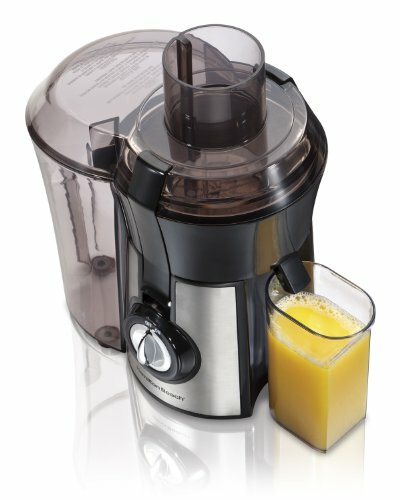 Really cheap and reliable juicer, meant for those who like their juice but aren’t too finicky about the end product and can live with a bit of froth.